The Doomsday Clock is an image representing the severity of threats to the planet and humanity in general. On the clock, times closer to midnight signify higher threats and midnight represents the end of the world. 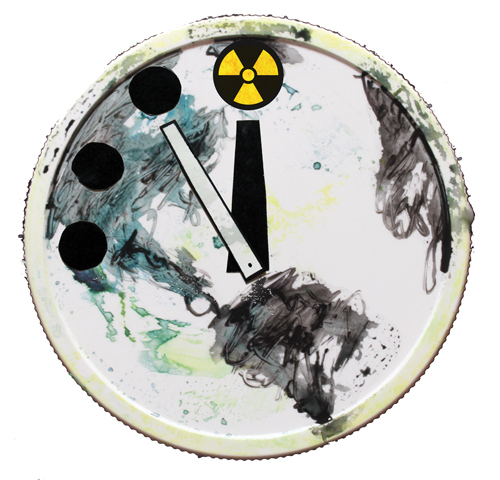 Devised in 1947, the clock was symbolic of the heightened nuclear fears of the Cold War era. It began at seven minutes to midnight and has been adjusted many times since then. The closest the clock ever came to midnight was two minutes in 1953, when the United States and the Soviet Union both tested the first thermonuclear weapons within nine months of each other. In 1991, when the U.S. and the U.S.S.R. began making cuts to their nuclear arsenals after the end of the Cold War, the clock was set at 17 minutes to midnight, the furthest it has ever been. The last adjustment was in 2010, after promising nuclear arms reduction talks between the U.S. and Russia, as well as the UN Climate Change Conference in Copenhagen. Until recently the clock sat at six minutes to midnight. But on Jan. 10, the Bulletin of the Atomic Scientists (BAS) announced that the clock was being moved ahead one minute, putting it at five minutes to midnight. The change was prompted by the lack of follow-up on diplomatic achievements. “The provisional developments of two years ago have not been sustained, and it makes sense to move the clock closer to midnight, back to the value it had in 2007,” said Lawrence Krauss, co-chair of the BAS board of sponsors. Changes like this have happened before. In 1995, the BAS moved the clock ahead three minutes, citing American “hard-liners” who “seem reluctant to soften their rhetoric or actions” toward the nascent Russian Federation and concerns over unsecured nuclear facilities in the former Soviet Union. Decisions about the Doomsday Clock are made by the BAS Science and Security Board with input from their Board of Sponsors. The BAS Board of Sponsors includes several well-known scientists such as Stephen Hawking, Freeman Dyson, and physics Nobel Prize winner Sheldon Glashow. Seventeen other Nobel Prize winners sit on the Board of Sponsors. The BAS is also concerned about climate change, warning we might be passing a point of no return. “Even if policy leaders decide in the future to reduce reliance on carbon-emitting technologies, it will be too late,” said Allison Macfarlane, a professor of environmental science at George Mason University and a member of the BAS Science and Security Board. But the clock’s main function is still to warn the public about nuclear dangers. One of the questions posed by the annual BAS symposium, where decisions about the Doomsday Clock are made, was about the future of nuclear power after the disaster at Japan’s Fukushima Daiichi power plant.